Do you care about saving our orangutans? Here at Udderly Healthy Soaps we strongly stand for Palm Oil Free Products. Palm oil is a cheap edible ingredient contained in many products. It is derived from the palm fruit which is grown on the African oil palm tree. 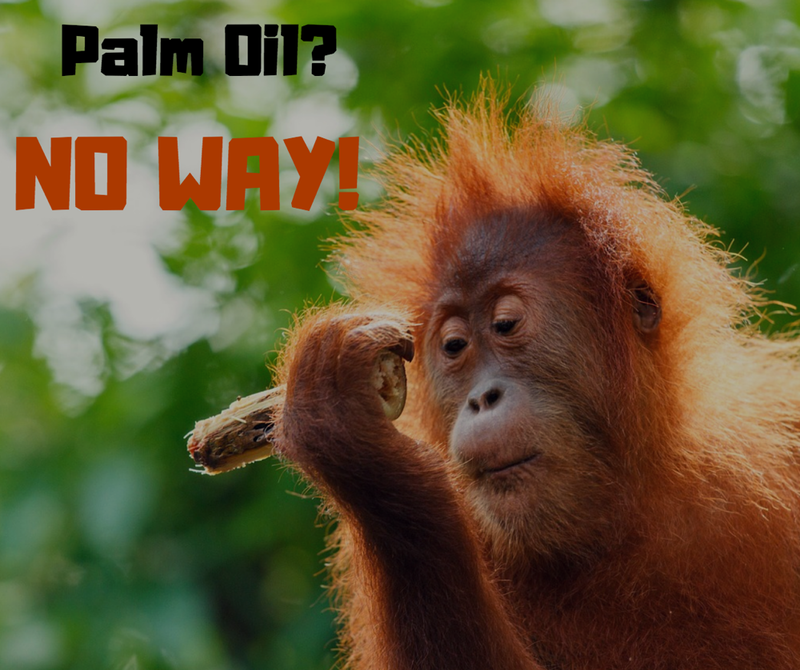 To make it even more confusing, Palm Oil has not only one name but a few as well as there being other ingredients derived from Palm Oil! Other names for Palm oil include Palmate, Cetyl Palmitate and Octyl Palmitate plus more, such as Sodium Lauryl Sulfate which can be made from Palm Oil. With these different names you may be supporting the palm oil industry without even knowing! Be sure to check your labels. The oil palms, originally from Western Africa, although can flourish in wherever rainfall and heat are abundant. Today, palm oil is grown throughout Asia, Africa, South America and North America, with 85% of all palm oil globally produced and exported from Indonesia and Malaysia. Sadly a lot of the time these places are not using sustainable measures to get the palm oil. Throughout the jungles of Borneo and Sumatra there are over 300,00 different animals found, many of which, during the deforestation are killed, injured and displaced. Sadly major human rights violations and child labour in remote areas of Indonesia and Malaysia have been linked to the palm oil industry. Bruises, cuts and heat exhaustion are common among the young children made to carry heavy loads of fruit. Sadly after spending hours and hours day in and day out, bent over collecting fruit these children receive little to no pay for the hard working efforts. Say No To Palm Oil and Rainforest Action Network explains a lot about palm oil and the impact it is having on our environment, orangutans and people. Don’t forget to check your labels on all your products. Some companies are now using Sustainable Palm Oil, but be sure to defiantly check this is the case. If it doesn’t say it’s Sustainable, don’t support it! Be assured all our products contain NO Palm Oil or ingredients derived from Palm Oil. 5 Incredible Facts About Coconut Oil!